I have always had a passion for wild and crazy socks. Sadly, I still possess and wear some of the same socks that I had in high school. They are just too cute to get rid of! I even wear fun wedding socks on Saturdays! 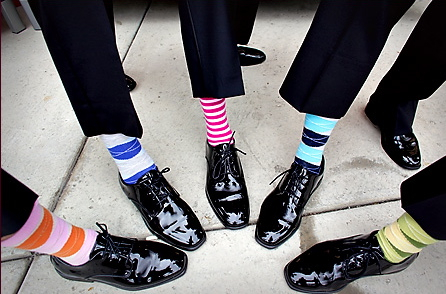 Needless to say, when the trend started for guys to wear wild socks on the wedding day, I was thrilled! It never gets old to me! Stripes, plaids, solid, but fun colors! I love them all! Thanks to Pretty Chicky for their photo!